Lenovo has entered the mid-range Android tablet market with a premium device worth paying attention to. It offers excellent value at an affordable price, and should be the first choice for new, non-iPad tablet buyers. The story of tablets, from their inception to the present, has been one of change. Starting as ‘laptop killers’, they have come in a variety of shapes and sizes, at almost every price point imaginable. Across the market, there are now two stratified positions, the super premium and the super cheap. Apple has claimed the former, and Amazon the latter. 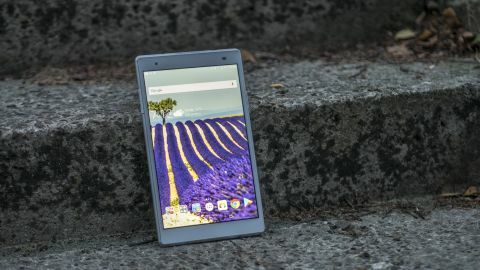 Enterprising firms wanting a slice of the pie now face an uphill challenge, that of carving their own niche: this is exactly what Lenovo is attempting to achieve with the Tab 4 8 Plus. Nonsensical moniker aside, this is a tablet with a lot going for it. In addition to a Snapdragon 625 chipset, 4GB of RAM, a 4,850mAh battery and an 8-inch 1,200 x 1,920 screen, it comes with dual front-facing speakers and a fancy glass sandwich design – starting from £200 (around $270 / AU$340). But against the likes of Samsung, Apple and Acer making similar moves at an equivalent price point, does the Lenovo Tab 4 8 Plus have what it takes to succeed? No matter what the competition is like, above a certain price any device requires a certain ‘special sauce’ to set it apart and justify its price tag. What this ‘special sauce’ may be depends heavily on the manufacturer, and indeed on the price point. While the likes of the Samsung Galaxy Tab S3 come with a stonking HDR-enabled Super AMOLED screen, those at the lower end – like the Amazon Fire line – are designed to simply be ‘life-proof’. The Lenovo is intended to serve up a refined balance, a middle ground, and that it achieves nicely. Perhaps the most noteworthy feature is the speakers, for there are two and they both fire forwards. That is towards the face, not behind the device, or in another mad direction. They are loud and proud of their location, even managing a little stereo separation. Inside, there is another pleasant surprise ticking away, a Qualcomm Snapdragon 625 chipset backed up with 4GB of RAM. The Tab 4 8 Plus powers through most tasks, with almost more speed than is needed for sofa net surfing sessions. Another benefit of this chipset is access to 5GHz Wi-Fi, meaning that when paired with a compatible router blazing internet speeds can be reached. This allows for huge downloads, big games and continent sized maps, which all fit nicely thanks to the included 64GB of internal storage. Designing a tablet is a somewhat difficult task. Go too far with decoration and adornments and you end up with an awful, overdone monstrosity. Leave too much out, and what is left blends into the woodwork, with no identity of its own. What Lenovo has attempted with the Tab 4 8 Plus is a mix of the two, throwing in the odd twist of personality with a classic, understated tone. The rear of the device is a single glass sheet, with the 8MP rear-facing camera placed in the top left along with a tiny flash, and a small silver ‘Lenovo’ logo occupying the center. On the top of the device you'll find the headphone jack, the left side houses a microSD card slot, while a power button (complete with a fast fingerprint scanner) and volume rocker can be found on the right side, and the bottom houses the USB-C charging port. The inclusion of USB-C is a nice touch, future proofing the Lenovo Tab 4 8 Plus considerably. The rim of the slate is all metal, quite a soft aluminum that we found to be susceptible to scratches, though this may have just been a quirk of the review unit. On the front of the device you'll find a 5MP selfie camera and the 8-inch, 1,200 x 1,920 IPS screen, protected by a sheet of Gorilla Glass. With excellent viewing angles, it makes for a great first impression – it can get reasonably bright too, and has a decent pixel density of 283 pixels per inch. One issue we found however, which is very common with LCD screens, is that whites were a little too cool for our liking. In all, while it is possible to get used to, the display is rather unsaturated, which ultimately may not be an issue for some. Those used to colors that pop will find this jarring, at least to begin with. It is certainly not quite on the same level as the iPad Pro 10.5 with its ‘True Tone’ display technology. It must be said that the choice of an 8-inch screen is an odd one, though certainly not bad. Avoiding the cramped feeling of smaller displays while being more portable than 10-inch tablets, it strikes a nice balance. Being 7mm thin and 300g in weight, the Tab 4 8 Plus is pleasant to use for hours on end.